Some medals are minted for Royal visits, special occasions, various awards, or for a sundry of reasons. Here are some examples for your viewing pleasure. 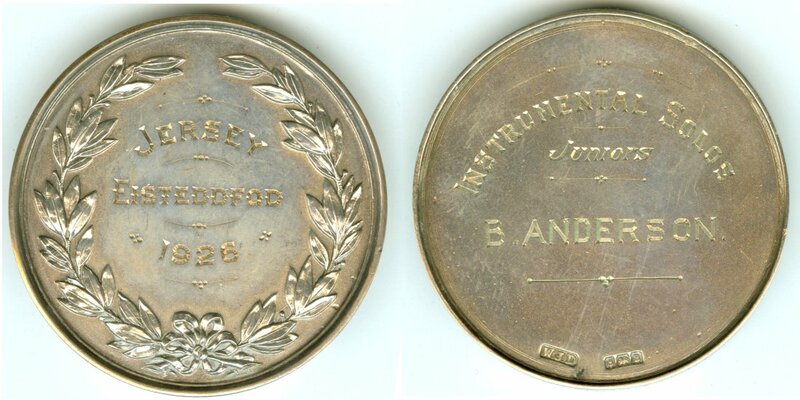 Eisteddfod 1926 Juniors Instrumental Solos awarded to B. Anderson. The hallmarks are an anchor (from Birmingham), a lion (92.5% pure silver), and the letter B (the year 1926). WJ Dingley, Birmingham, was the manufacturer. 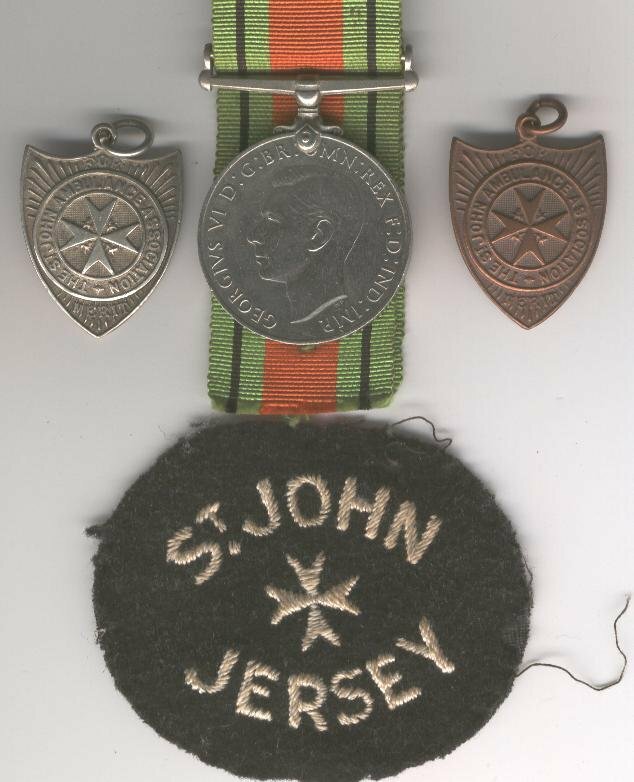 Victoria College Jersey, The King's Prize Medal, undated. AV 39, by A. G. Wyon. Bare head of the King left rev. crowned arms of the college dividing G - R within roseace. 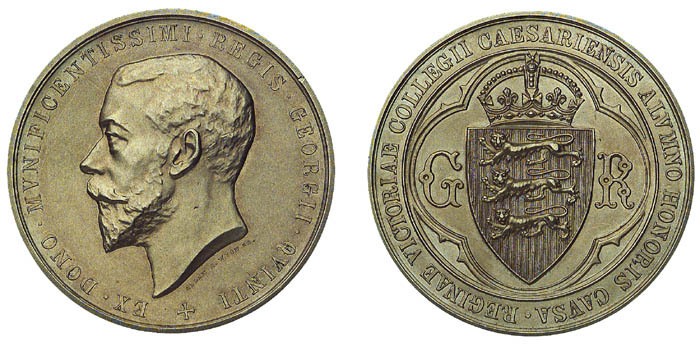 This extremely rare, gilt-bronze medal by T. H. Paget is the King's Medal, awarded by the Victoria College, Jersey, for outstanding merit in mathematics, languages or classics/science. The Lieutenant-General of Jersey, Sir Horace Coury Martelli on December 3, 1937, awarded the medal to P. A. Bromhead for outstanding merit in classics. The edge is inscribed with the recipient's name. The diameter is 38mm and condition EF. A rare Victorian commemorative medal of Queen Victoria and Prince Albert's visit to the Channel Island of Jersey in 1846 to open the new harbor. This example has the edge engraved as follows: "T.Le G." & "2e Visite de la Reine 13 Aout 1859". 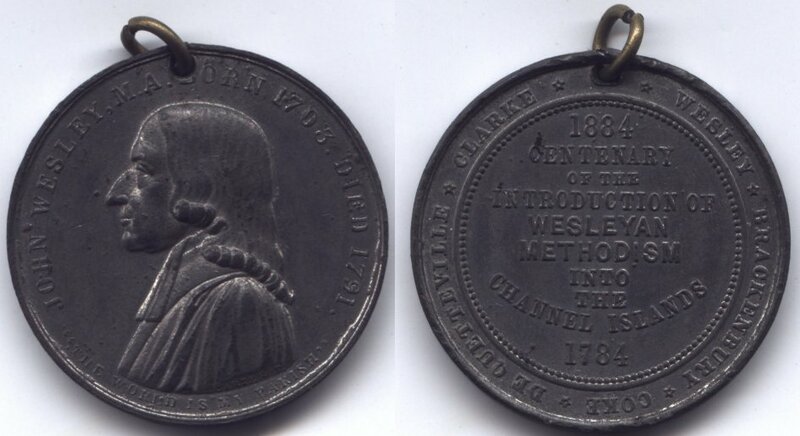 The engraving indicates the medallion was re-issued for Victoria's 2nd visit in August 1859. Le Gallais was the local jeweler who had the medals struck. Image courtesy of Stuart Elliott. 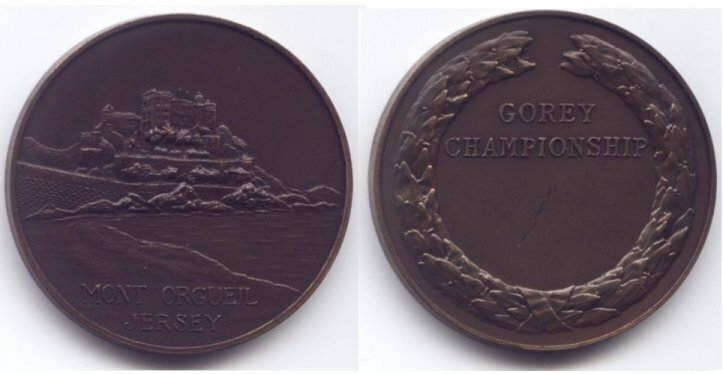 Another rare Victorian commemorative medal of Queen Victoria and Prince Albert's visit to the Channel Island of Jersey in 1846 to open the new harbor. This example is in copper. 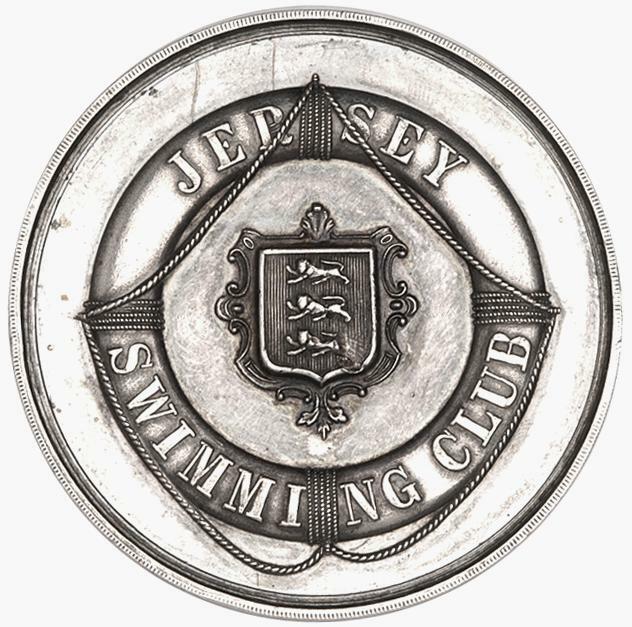 The 1876 Coinage Committee wanted the reverse to be "similar to, though not an exact copy of the Channel Islands' Exhibition Medal 1871, which also contains other arms than those of the Island. 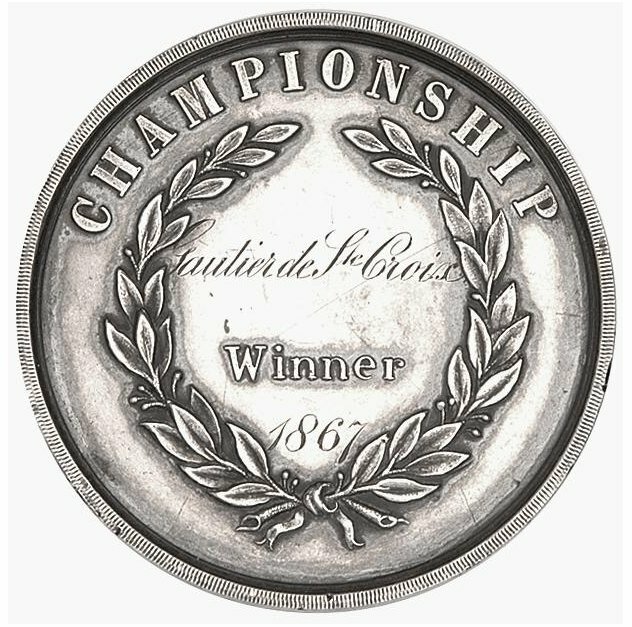 As regards [to] the obverse, the Committee is particularly desirous of retaining that of the Jersey coinage, one penny and one half penny pieces of which are herein enclosed-- the only alteration needed being the substitution of the year 1876 for 1866, or 1870." Images courtesy of Stuart Elliott. Championship medal, lifebelt around arms, rev. wreath, named (Gautier de Ste Croix, Winner, 1867).